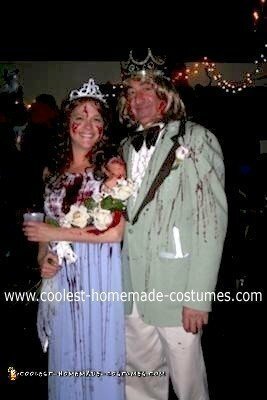 This Homemade Carrie Prom Queen Nightmare Costume is made with a Prom dress of 70-80’s style. Purchased liquid blood and dripped it so it was running down all sides. Silk roses with silk ribbon with droplets of blood. Blood on face, arms and flesh showing. Prom Queen tiara. Prom King, 80’s suit, 80’s hair, king crown, prom king sash. I widened the lapel on the suit with brown felt for the 80’s look and purchased a ruffled shirt from a tuxedo shop. I was lucky to find it. Rose corsage dipped in blood.